Puerto Rico Gov. 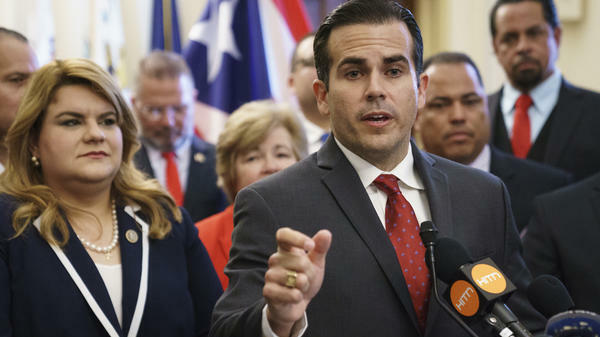 Ricardo Rosselló, right, speaks during a ceremony on Capitol Hill on June 27, 2018. On Thursday, Rosselló demanded the resignation of any member of PREPA's board who refused to cut the new CEO's $750,000 salary. The board had named PREPA board member and former General Electric executive Rafael Díaz Granados as its new CEO just a day earlier, at an annual salary of $750,000. His appointment followed the abrupt resignation of Walter Higgins, who had served as CEO for less than four months and announced his departure Wednesday amid a cloud of controversy over his own $450,000 salary. But news of Díaz Granados' even larger salary sparked an outcry among politicians, including Puerto Rico's governor, who was traveling to Russia to watch the World Cup final. On Thursday morning, Gov. Ricardo Rosselló demanded the resignation of any member of PREPA's board unwilling to cut Díaz Granados' salary, which Rosselló called "not proportional to the financial condition of PREPA, to the fiscal situation of the government, or to the feeling of the people who are making sacrifices to raise Puerto Rico." A short time later, five board members, including the newly named CEO, resigned, leaving the utility's governing body without a quorum and without a chief executive to replace the outgoing CEO once he departs at the end of the week. In a joint letter to the governor, the resigning board members decried what they called "the petty political interests of politicians" who they said were determined to retain control of the utility and who they accused of putting "at risk" the process of "transforming the Puerto Rican electricity sector." It was a dizzying 24 hours at the already troubled utility, which is bankrupt and $9 billion in debt, has churned through a succession of leaders in the 10 months since Hurricane Maria destroyed the electric grid last fall, and is still struggling to restore power to all of the customers who lost it after the storm. Díaz Granados would have become the fourth CEO since the hurricane, and would have been tasked with overseeing the public utility's privatization, which the governor signed into law last month. In an interview with the island's largest newspaper, El Nuevo Dia, after his appointment was announced, Díaz Granados defended his salary, saying it was in line with what a utility of PREPA's size and scope would pay a chief executive, and in fact was much less that what he could earn elsewhere. Granados had said one of his goals was to help PREPA retake control of its own future, rather than continue to be "a spectator" as outside entities like the Federal Emergency Management Agency and the U.S. Army Corps of Engineers dictated the island's energy future. But following his and the other board members' sudden resignation, the government's attention on Thursday turned to simply restoring a quorum to the crippled board so that it could continue to run the utility. The governor said he would act quickly to name replacements, and officials said they expected the new board would appoint another CEO by the end of the week.